Entertainment Hall at the Souring Eagle, where the stage has recently been upgraded with a variety of Martin Audio loudspeakers. 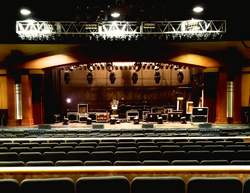 The Soaring Eagle Casino & Resort (Mount Pleasant, MI) offers the sixth largest concert auditorium in Michigan that hosts a steady stream of top entertainment, and it’s recently upgraded with a variety of Martin Audio loudspeakers. Specifically, Entertainment Hall recently added 20 Martin Audio LE2100 3-way differential dispersion stage monitors, plus four XD15 high-output full-range loudspeakers and four DSX powered subwoofers for side fills. “I really like them,” Kubin says. “I’ve heard literally hundreds of different speakers because we do 60 national acts a year here and the Martin Audio speakers are my favorite. Love the side fill speakers—they’re high output but they don’t hurt your ears, and the coverage is awesome. “For monitors, I was looking for a 2 x 12 box because of the wide dispersion,” he continues, “and Martin Audio was one of the few companies offering a high output 2 x 12 stage monitor. They are beautiful sounding monitors and give us high gain before feedback, a critically important factor for our shows. The venue books an eclectic lineup of live performers, including comedians Chris Tucker and Kathy Griffin, Steve Martin and Martin Short with the Steep Canyon Rangers, rock acts such as Grand Funk Railroad and The Guess Who, and country artists Clint Black and Loretta Lynn. “When we do R&B acts, it’s usually a big test of whether the monitors can hold up or not, and for the Keith Sweat with Mint Condition show, we used 19 of the 20 Martin Audio LE2100s and they passed with flying colors,” he concludes.